Larry Kliger of Lawrence Allen Associates represents BB Properties in the disposition of a multi-tenant asset. Larry Kliger became President of Lawrence Allen & Associates after nearly three years as a Vice President with Grubb & Ellis. Operating throughout Southern California, Larry finished as one of the top producing agents for Grubb & Ellis’ Industrial Division in the San Gabriel Valley. Larry worked with such clients as US Plastics, GE, Caterpillar and other industry leaders in finding real estate solutions. Larry started his career at Daum Commercial where he was a Bill Daum Award recipient for his dedication to client success. Since coming over to Lawrence Allen & Associates, Larry has forged the reputation of this boutique firm as one with superior market and transactional expertise, including transactions with local businesses as well as national level entities such as Majestic Realty, Prologis, ING, and others. Since joining Lawrence Allen & Associates, Larry has nearly tripled the size of the property management portfolio, and started the investment arm of the company, among other accomplishments. 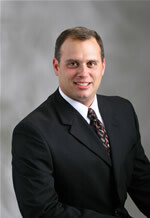 Larry specializes in commercial real estate with an emphasis on Industrial and Office product.